سنة 1596 (MDXCVI) كانت سنة كبيسة تبدأ يوم الاثنين (الرابط يعرض التقويم كاملاً) التقويم الگريگوري، السنة 1596th بعد الميلاد (م)، السنة 596th في الألفية 2، السنة 96th في القرن 16، والسنة 7th في عقد 1590 بين 1583 و 1929 ومع فارق 1596 is 10 يوم عن التقويم اليوليوسي، والذين ظلوا مستخدمين حتى التحول الكامل إلى التقويم الگريگوري في 1929. February 14 – Archbishop John Whitgift begins building his hospital at Croydon. April 9 – Siege of Calais: Spanish troops capture Calais. May 18 – Willem Barents leaves Vlie, on his third and final Arctic voyage. June – Sir John Norreys and Sir Geoffrey Fenton travel to Connaught, to parley with the local Irish lords. June 10 – Willem Barents and Jacob van Heemskerk discover Bear Island. June 17 – Willem Barents discovers Spitsbergen. June 24 – Cornelis de Houtman arrives in Banten, the first Dutch sailor to reach Indonesia..
July 5 – An English fleet, commanded by Robert Devereux, 2nd Earl of Essex, and Lord Howard of Effingham, sacks Cádiz. July 14 – King Dominicus Corea (Edirille Bandara) is beheaded by the Portuguese in Colombo, Ceylon. August – David Fabricius discovers the star Mira. September 17 – The Spanish capture Amiens. September 20 – Diego de Montemayor founds the city of Monterrey, Mexico. October 8–10 – The Union of Brest: The Ukrainian Church west of the Dnieper becomes known as the Ukrainian Rite of Catholicism, whereas the East officially renounces the authority of the Pope. October 18 – The Second Armada, a Spanish fleet sent to attack England in revenge for the raid on Cadiz, is wrecked in storms between Corcubion and Cape Finisterre; 2,000 men are lost. October 19 – The Spanish galleon San Felipe founders in Japan, leading to 26 Christians being martyred the next year. 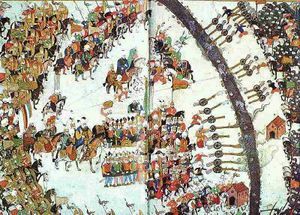 October 24–26 – Battle of Keresztes: The Turks defeat a combined Habsburg–Transylvanian army. Elizabeth I of England decrees that all Africans should be removed from the British realm, in reaction to the food crisis. The first water closet, by Sir John Harington, is installed in a manor near Kelston in England. King Sigismund III Vasa moves the capital of Poland from Kraków to Warsaw. Sidney Sussex College, Cambridge, is founded. The Black Death hits parts of Europe. Dutch ships, commanded by Frederick de Houtman, reach Sumatra and Java for the first time. The fourth of a five year run of poor harvests, largely caused by the weather, a pattern typical of the last third of the century. This causes famine throughout Europe, which leads to food riots in Britain. ^ Emily C. Bartels (April 2006). "Too Many Blackamoors: Deportation, Discrimination, and Elizabeth I". SEL: Studies in English Literature 1500–1900. 46 (2). Rice University: 305–322. JSTOR 3844644. In 1596, Queen Elizabeth issued an 'open letter' to the Lord Mayor of London, announcing that 'there are of late divers black-moores brought into this realme, of which kinde of people there aire allready [ك‍] here to manie,' and ordering that they be deported from the country.